In an authentic celebration and salute to David Bowie, aka Ziggy Stardust and the Thin White Duke, the UK’s No. 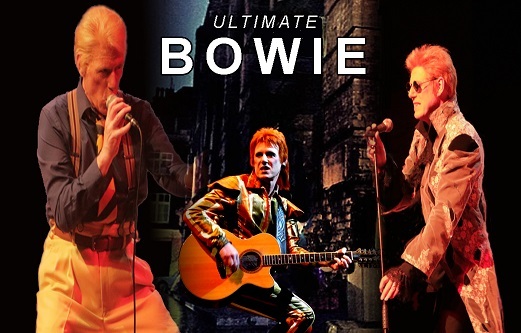 1 David Bowie tribute show ULTIMATE BOWIE starring Ed Blaney will transport you across the golden years of Bowie, from Spaceboy to Superstar. Media in the UK, internationally and, more importantly for Ed, the Bowie fans reviews, highlight the fact that Ed possesses Bowie’s awe-inspiring vocal prowess. A performer who easily commands the eyes of the audience every moment he is on stage, Ed blends past and present, showing the many sides of Bowie’s personality. Precise attention to detail has been taken under Ed’s musical direction of his seven-piece band through to the costumes he wears to “recreate” Bowie in spectacular style. Ed Blaney’s ULTIMATE BOWIE delivers a stunning two-hour show of Bowie classics, from “Space Oddity” to “Let’s Dance” to David’s latest massive hit “Blackstar”. The band is not called “Ultimate Bowie” for nothing – This show captures the essence and authenticity of David Bowie in concert!